One of the sure signs of a gentleman is their appearance. No man who considers himself to be a gentleman would ever leave their house without making sure their grooming was impeccable. And of course, a true gentleman will always shake hands when they meet someone. That’s why an important part of flawless grooming is having a set of the best nail clippers. A true gentleman will always look their best whether they are at work, enjoying a night on the town, out of town on business, or on vacation. Men who take care to find the best singlet for men shouldn’t skimp on finding the best tools to trim their nails. 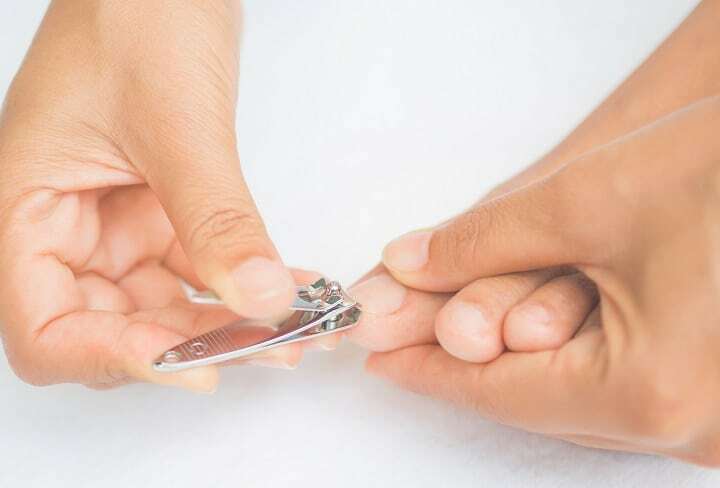 Nail clippers are one of those items that tend to be an afterthought, but it is important to buy a decent pair in order to keep your nails looking immaculate. Many men make the mistake of purchasing clippers at the gas station or a dollar store. However, the fact of the matter is that this is a purchase that you shouldn’t cut corners on. Just as you want to invest in the best pajamas for men for a truly restful sleep, you want to invest in a good pair of nail clippers. A cheap pair of nail clippers simply won’t do. But what makes one set of clippers a better investment than others? Here we’ll go over the different types and a guide to how to keep your nails impeccably groomed. What Is a Nail Clipper and What Are the Benefits of Using It? The simplest explanation is that nail clippers are what you use to trim your fingernails and toenails. Structurally, they are two pieces of metal with curved facing blades on one end. When you exert pressure onto a lever, these two pieces are pressed together. In turn, this transfers the pressure to the blades. Nail clippers are the smallest type of trimming tools for nails. There are smaller types that are mainly for fingernails, and bigger types for fingernails and toenails. Lastly, there are toenail clippers that are the same size as large clippers, but they have straight blades instead of curved ones. There are many benefits to nail clippers beyond the obvious fact that they trim your nails. Quality nail clippers can actually protect you from infection and disease. The reason you want to avoid cheap models is that they typically have a nickel-plated body. This coating makes the clippers more susceptible to rusting and mold growth. When you want quality clippers, go for stainless steel clippers. Stainless steel will not rust and inhibits mold and bacteria from growing on the metal. This is why professional hair clippers are often made of stainless steel – it ensures that no bacteria and other contagions can hang around areas where you may potentially get a cut. 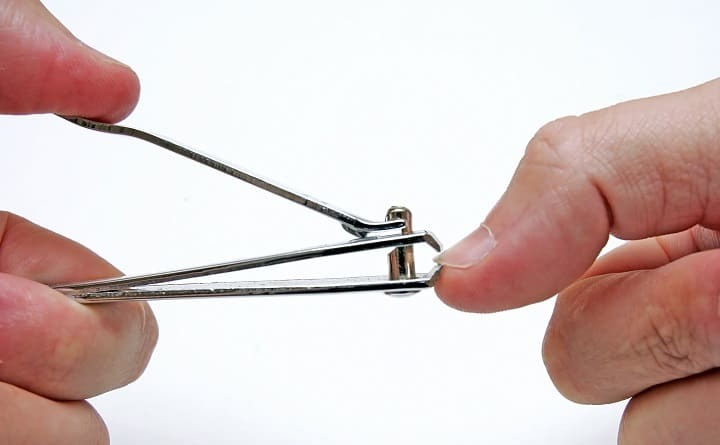 For nail clippers, this is important because sometimes you can cut your nails a bit too short. This can result in a little bleeding, which could lead to an infection if care isn’t taken. 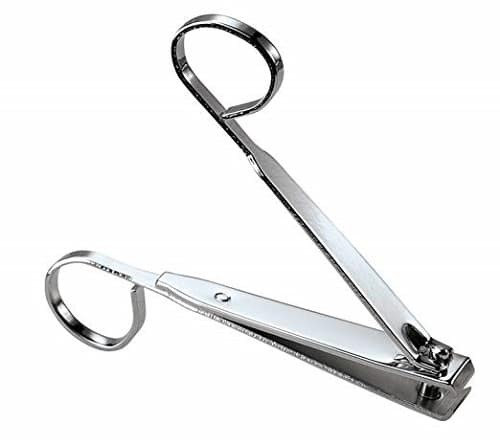 Nail clippers also will keep you from getting infections that can occur when you bite your nails. 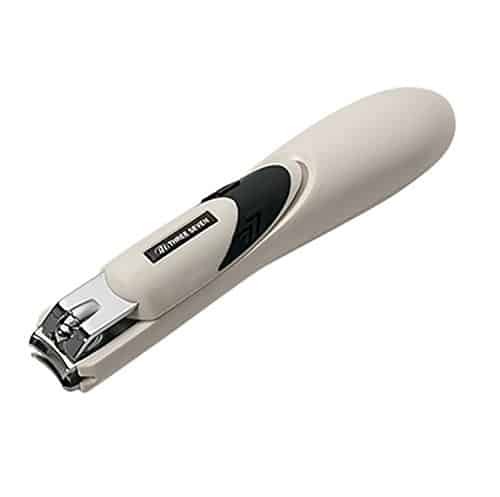 Using cheap clippers will cause the nail to tear once it grows out, which is why you want a good sharp pair of clippers. This way the nail is cut all the way through and the chances of infection are minimal. The other benefit is that when you use clippers properly, they will keep your fingernails looking like you have had a manicure. Let’s face it, people notice your hands right away, especially when you shake hands regularly. Neatly trimmed nails are just another sign that you take pride in your appearance. 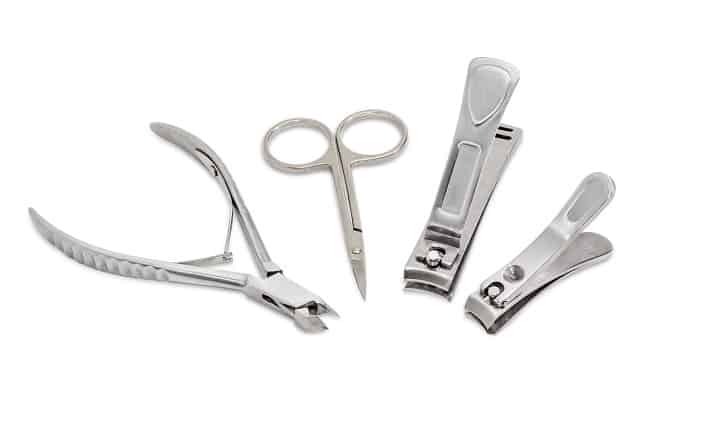 What Are the Different Types of Nail Clippers? 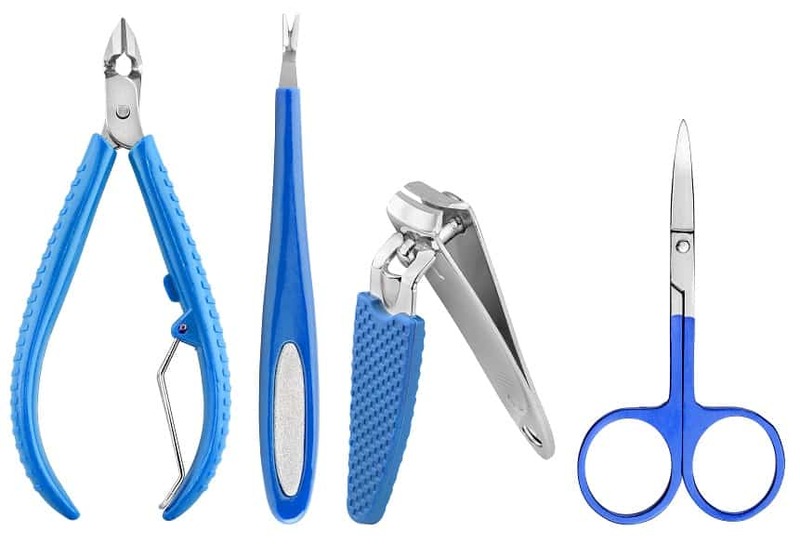 Fingernail and toenail clippers come in four main variations. They are a guillotine, lever-type, nipper, and scissor clippers. You might have one or a couple types of these in your complete grooming kit. These are easy to use and have a curved shape with sharp edges. 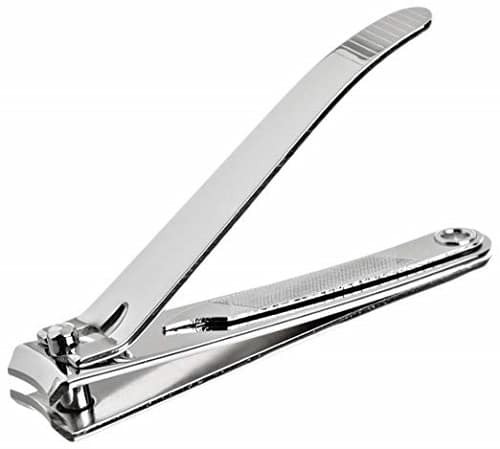 This is the most common type that people think of when picturing nail clippers. 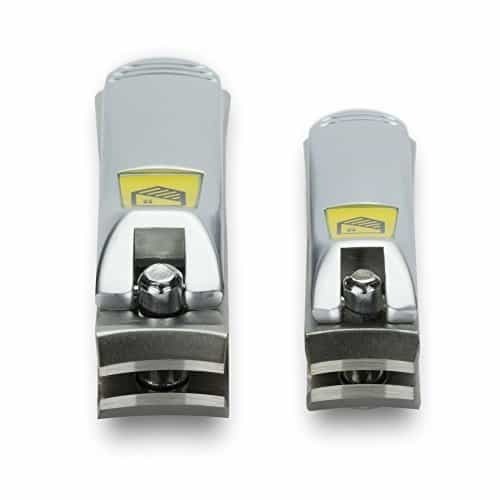 These clippers have horizontal heads with a narrow opening that can handle any type of nail. This is the type that resembles a pair of pliers and has either straight or concave blades to cut the trickier and thicker nails. This last style of clippers are the ones that generally come in a manicure set. They look like a smaller pair of scissors and provide smooth cuts. Technology has certainly caused some innovation in men’s grooming. Consider, for example, how the tools used to achieve the best beard styles have advanced over time from simple scissors and a straight razor to top rated beard trimmers. The same can be said of the tools that are used to trim nails. For the last hundred years, most everyone has used clippers of some sort to deal with their nails. Now they have gone so far as to bring electric nail clippers onto the market. These are really easy to use. You simply place a finger into the aperture and let the device do all the work. Electric models are surprisingly not all that expensive although they will require batteries being replaced at times, which can add to the cost. While they are just as effective as manual clippers, manual clippers will only require you to buy them once, making them great for all types of wallets and budgets. You know exactly how much you will have to spend to keep your nails looking great. 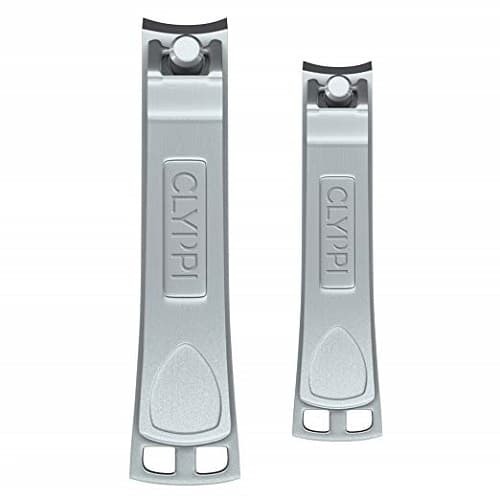 Expertly designed to make your nail cutting session a breeze Clyppi Nail Clipper is actually a set that consists of a big nail clipper for the toenails and a small for the fingernails. 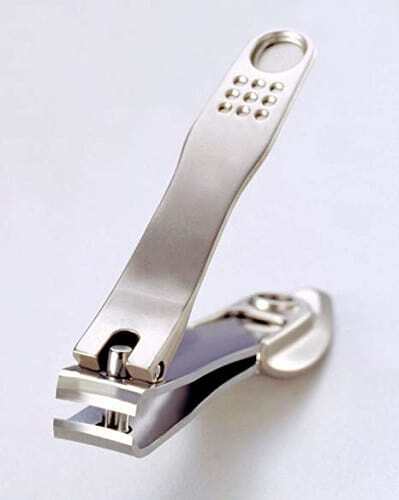 The toenail clipper measures 3.4 inches, while the fingernail clipper is 2.6 inches long. The set is ideal for both men and women. Both of the products are equipped with a double-sided file that has two levels of roughness. They’re quite practical and will allow you to shape your nails precisely the way you want them. The clippers are ergonomically designed to be easy and comfortable to handle. Built to ensure that you cut your nails effortlessly Keiby Citom pair of nail clippers has a 360-degrees rotating head, which ensures you don’t have to deal with awkward positions while clipping the nails. The clippers are made of top-grade stainless-steel. They are very sturdy and will last for ages. The pair is offered with a sperate nail file with varying levels of roughness. You can shape your nails the way you want after you’re done clipping them. Thanks to the rotating head you get to cut your nails from all the angles, without fearing that the clippers will slip from your hand because their ergonomic design prevents this. 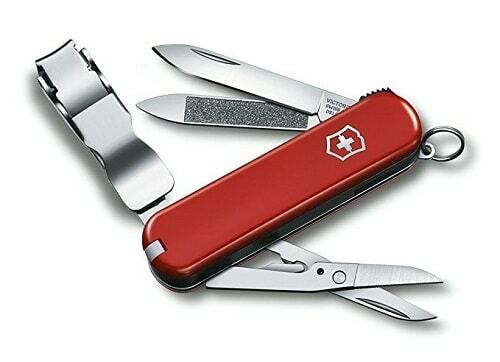 Victorinox Swiss Army Nail Clipper has seven implements, each with a different function. It comes with a red cellidor handle design as well. The implements include a blade, nail file, pair of scissors, tweezers and a toothpick. Multipurpose as it is, this product is made with strong and durable materials and it comes with a lifetime warranty. Its great aesthetic makes it also appealing, along with being practical. Because it has a key ring, it would look great as a key holder. Of course, it’s crucial to mention that the blades are very sharp and cut nails fast and with high precision. 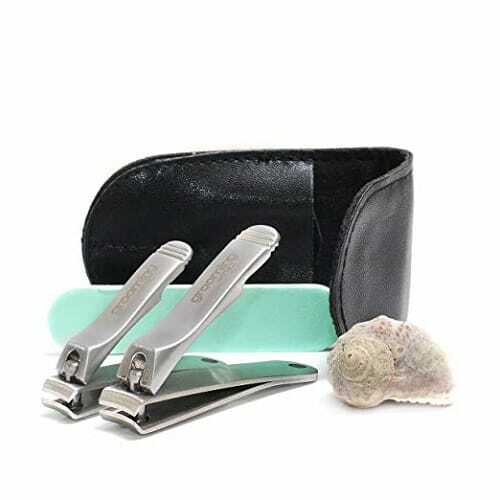 Ideal for traveling, Grooming District Nail Clipper Set consists of a fingernail clipper, toenail clipper, double-sided emery board and a black leather case for storage. Each of the clippers has an inbuilt nail file. The small one is optimized to deliver precision and accuracy, while the large one offers optimal cutting power and efficiency. Even though it’s precise, the small clipper could use levers with more leverage because the way it is, it might not be powerful enough to cut through tougher fingernails. The item is made of high-quality stainless steel and has a matte finish. Coming as a set of hand-sharpened wide nail clippers Harperton features toenail and fingernail clipper. Both of them are quite versatile. They can be used by men and women and for clipping children’s nails as well. These clippers are made of a top-grade surgical stainless steel. They have forged levers that have more leverage. A slight press of the lever is all you need to cut through the nails. There are integrated nail files as well. Quite sturdy and with wide levers, this product is very simple and safe to handle. Handcrafted in Japan, SEKI EDGE Fingernail Clipper is made with top grade hardened stainless steel. It’s ergonomically designed to ensure it fits perfectly in your hand. The die-cast lever is sturdy and strong. It’s also quite long and offers ample leverage and cutting power. A slight press of the lever delivers a powerful but smooth and precise cut. You can expect no jagged nail edges, tearing or ripping. This product is one of the finest fingernail clippers you can find. Simply built, but quite effective, Revlon Toenail Clipper has curved blades that help you cut your nails at almost any angle. This type of blades is quite safe as well. It reduces the chance of nicking your skin as you work. This product is very lightweight but sturdy and strong. It’s made of tempered stainless steel and comes with a foldaway nail file that will help you shape your nails perfectly. You can use it to clean under nails area as well. The lever is designed to be easy to operate with both hands and it’s also textured to ensure you have a firm grip on it. 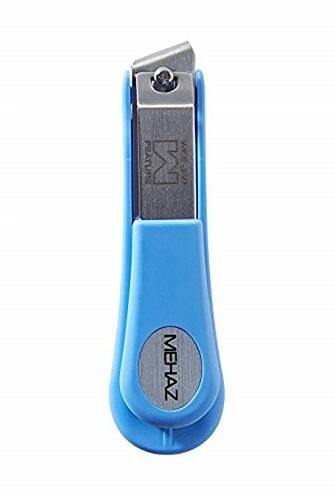 Angled straight blades of Mehaz Toenail Clipper are quite effective in cutting and shaping the edges of your toenails. 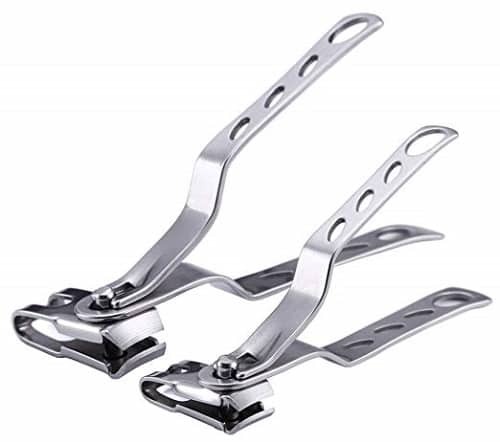 Being angled helps them reach into delicate areas of the toenails and cut off the ingrown nails with great precision. This additionally helps fight fungal infections. The clipper has a wide jaw and is ideal for wide toenails. It has an inbuilt file and a clipping catcher as well. The lever is rubberized and has a round shape. This ensures you can push it firmly without fearing it will slip. Green Bell Nail Clipper is made of hardened stainless steel and delivers precise but gentle nail cuts, giving them an ideal shape. You don’t have to go through the hassle of filing the nails ever again. This item is an excellent option for older people whose hands might not be very stable. The product can be used on both the fingernails and toenails, although it might be too wide for men with smaller fingers. The lever is long to provide more leverage and deliver more power when pushed down. 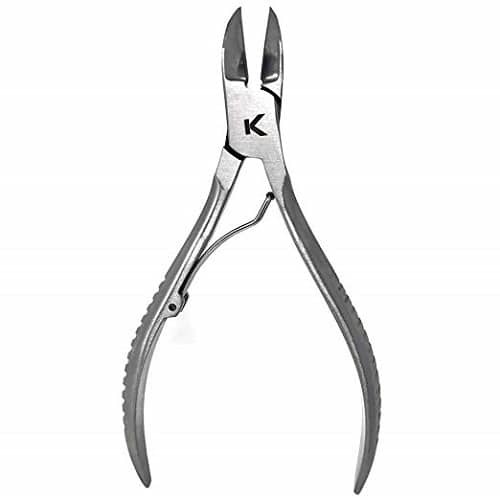 Kohm Toenail Clipper is designed for cutting ingrown or thick and hard toenails. Some men can develop very hard toenails as a result of fungal infections. Such toenails are difficult to cut with an ordinary nail clipper, but this product is meant to deal precisely with this type of problem. It looks like a pair of pliers and it’s quite strong. There’s also a convenient user guide for first-time users. It comes with a tip cover to ensure the tip stays in perfect condition. The handles are contoured to ensure your hands don’t slip while working with it. Made for cutting thick nails, Three Seven Nail clipper is a bit heavier than conventional toenail clippers. It can deal effectively with deformed toenails or those affected by athlete’s foot. Although the clipper itself is quite powerful, its lever could be a bit longer because that way it would provide better leverage and power. The jaw opens 4mm wide which is wide enough for very thick toenails. The product’s exterior is covered with silicone, which makes it comfortable and easy to handle. Finally, there are a nail file and a nail brush to make your nail cutting experience easier and seamless. 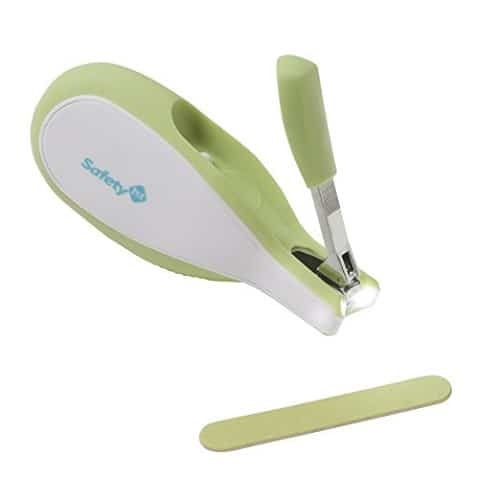 With scissor-like handle, EasyComforts Nail Clippers are quite simple to operate. They are ideal for people suffering from arthritis as well. The long levers provide ample leverage and cutting power and straight edges make it easy to reach into tight corners of a nail. These clippers are sharp and will deliver a clean and smooth cut every time. Rarely will you require to file your nails afterward. The fact that they’re quite sturdy and strong comes from the fact they’re made of hardened stainless steel. As the name suggests, Safety 1st Sleepy Baby Nail Clipper is designed for clipping baby nails, but also men with softer nails. It’s designed to ensure the safety of your fingers and is quite easy to operate with, although the lever might be too small if you have large hands. Although small, they have edges that are sharp enough to cut through your nails. The outer part of the clipper is covered with rubber to ensure you have a good grip. There’s also an innovative feature, which is a light at the cutting tip that ensures you can clearly see what you are doing. Here we’ll give you a breakdown of how to use nail clippers. Before diving in, there’s some information you’ll want to know about prepping your nails. Prior to clipping any of your nails you want to wash the nails with warm water. This will help soften the nail and remove any calcification and dirt that could cause a potential infection. While you are soaking your nails, you also want to soak the clippers in warm water and detergent or antibacterial soap to make sure they are clean. Then you simply dry your nails. If you really want to go for the full luxurious experience, you can use the best hair dryer to dry your nails and clippers. Keeping the nail beds warm helps to make the nails more amenable to clipping. Once your nails are dry, you can begin. It also helps to have a handy receptacle to place the clippings in so that you don’t step on them by accident. Dealing with toenails can be a bit of a challenge. Care needs to be taken to make sure you don’t cut too much of the nail off. If you do, it could lead to an ingrown toenail. Because of how much weight is put on the feet, the last thing you want to do is cause the nail bed to be exposed because it can be quite painful. Start with a set of larger clippers with a straight blade. Next, place the toenail in the opening between the blades and gently press down until the nail is clipped away. As you trim, make sure you clip so that is straight across and not curved towards where the nail meets the skin around the cuticle. Pro Tip: It is best to cut multiple times instead of with one cut. One cut can lead to tearing away part of the nail which is not a good look. Fingernails are trimmed in much the same way as toenails. However, with fingernails, you want to shape them with a curve instead of straight across. Start with a set of smaller clippers as these will allow you to shape and get a closer trim. Only cut away the off-white crescent portion of the nail. Stop at the nail bed, where you’ll see a noticeable change in color. Trim so that you curve the nail slightly towards the point where the nail meets the cuticle and skin. This way you still will have a bit of nail left but not so much that you accidentally scratch someone. Use the clipper to make multiple cuts to your nails. This keeps from tearing any of the nail away and resulting in bleeding in the corners of the nail where it meets the cuticle. This is the number one way that you can get an infection. Pro Tip: It is important to resist the urge to keep clipping the nail down. You only want the nail to be even with the end of the finger itself. How Often Should I Trim My Nails? For most men, tending to their nails is a task that only needs to be done once or twice a week. This should be just right to keep the nails from getting too long and out of control. Any more frequently than this, and you are probably just going to be keeping the nails too short. If you start to notice any sensitivity around the part of the nail where it meets the cuticle, it could be a sign of a potential ingrown nail. If this occurs, you should take care to gently cut away the affected skin and nail to keep it from getting worse. If the situation does get worse, you may have to see manicurist or possibly even a doctor. 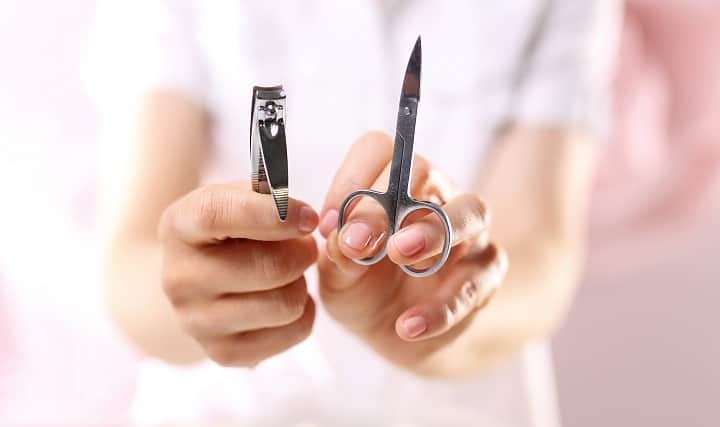 Nail Clippers Versus Manicure Scissors, Which Type Is Best? This is a question that really is more an issue of personal comfort. For the most part, guillotine and lever-type clippers are perfect for the task, but all the different types will work. The only downside to the first two types of clippers is that if they are made of softer metals, it is possible that they can become dull with age. Then they will possibly need to be replaced so that you don’t begin tearing your nails. Nipper clippers and scissor types work just as well and are great for shaping nails. These versions also offer better control so that you won’t accidentally cut yourself. These last two types are also used regularly on baby’s nails because of their ease of use. The control they afford the user makes it possible to work on more sensitive fingernails and can keep you from harming an infant’s fingers. This is another issue of personal preference. Many men simply do not see the need to visit a manicurist. It’s much like going to a barber for a shave. Some men already have an alum block and the razors they want for a pristine shave. The same can be said for going to a manicurist. If you already have the tools you need, then you can save time and money clipping your nails yourself and polishing the nails with an emery board. Other men though who take pride in their appearance tend to be more likely to visit a manicurist. Visiting a manicurist can be a luxurious experience. Plus, it ensures that a man’s nails look as good as every other aspect of their appearance. With so many options available for a man to take care of their nails, there is no excuse for a gentleman to not tend to this smallest of personal grooming habits. It’s about as standard to grooming as making sure you always have your choice for a face wash for men stocked in your medicine cabinet at all times. Making sure that your fingernails look great is an excellent way to show that you care about the little things. It doesn’t matter the way in which you maintain your nails as long as you do maintain them. Just please don’t bite your nails – that is never a good look for a gentleman. Photos from: robertprzybysz / depositphotos.com, freefly / depositphotos.com, anmbph / depositphotos.com, spukkato / depositphotos.com, arthur.mustafa / depositphotos.com.